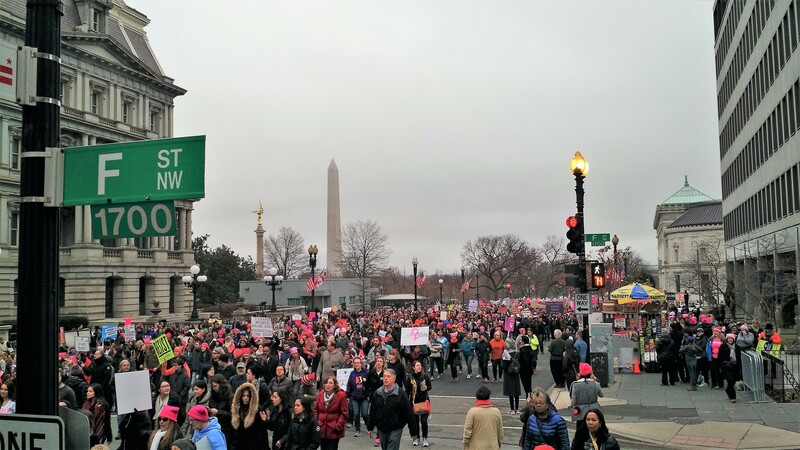 The Women's March on Washington, D.C., January 21, 2017. The past two weeks of revelations about producer Harvey Weinstein, along with numerous other power figures in Hollywood and beyond, appears to finally be ushering in a sea change. Women are opening up about their experiences, primarily on social media under the hashtag #MeToo. This is a welcome and long-overdue reveille. But in the aftermath it has become clear that a second confessional tidal wave has yet to wash ashore—namely, from that reticent, one-time majority: men. Women who have spoken out are rightfully asking, “Where are the guys on this?” Their frustration is apt. While some men—mostly celebrities—have come to the defense of their peers and colleagues, a tiny sample of American males has weighed in at all. Less surprisingly, even fewer have admitted complicity, or divulged any part of their own shameful pasts. Oscar-winning actress Lupita Nyong’o, a frequent mark of Weinstein’s who was silent years ago after being victimized, reflected: “I did not know that things could change. I did not know that anybody wanted things to change.” Well, I desperately want things to change, and it simply won’t happen unless we are willing to admit the full extent of the problem; that is, for us men to have the courage to say I am the problem. To show just how easy this can be, let me start. In my past as a bachelor, I overstepped my bounds with women. Period. There is no other way to put it. I exercised my assumed power as a male, topped off with plenty of white privilege and youthful entitlement. That none of my actions crossed legal lines is irrelevant. I was too aggressive, presumptuous, insistent, leering, objectifying, impatient, opportunistic. There were no laws to stop me from my boorish behavior, but that is no excuse. Basic standards of ethics and decency tell us the law which matters most is that which resides within us, derived from good sense and common respect for others, and for which we are the only enforcers. In that regard, my moral machinery failed. I failed. If any of my actions caused confusion, mistrust, or hurt, I am deeply sorry. I’m happily married now. My brave and outspoken wife, a veteran of the non-profit sector and advocacy champion, believes there is no more important issue than this one, and she’s right. Like every woman, she has been on the receiving end of mistreatment, from the classroom to the workplace to public spaces in general. It was she who first opened my eyes to the ubiquity, depth, and toxicity of the problem (not just damaging women, but also the nation and its progress as a whole). Only after frank discussions about the real toll of the abuse exacted on our sisters, daughters, nieces, aunts, mothers, spouses, and girlfriends could I see the true effects of my erstwhile conduct. We can point our fingers at the Harvey Weinsteins of the world all we want, but we can only move forward and fix problems if we are willing to find fault in our own actions. Fortunately, an honest conversation can engender such an unveiling, to expose our vulnerabilities, regardless of demographic. I believe this broader vision of unity is what activist Tarana Burke had in mind when she started the #MeToo campaign a decade ago. hashtag for men who wish to come clean as I have: #Ididit. Greg Eck is a Washington, D.C. area resident, former Capitol Hill staffer, founder of the defunct social criticism blog The Loquitor, and an unrepentant political junkie. He holds a B.A in English & Rhetoric from DePaul University and an M.A. in Literature from the College of Charleston/The Citadel. Mr. Eck has worked in a diverse range of jobs over his career, from college administrator and teacher to government contractor and programmer, with a few stints as a restaurant cook in between. Today he earns his living as a technical writer in the private sector. When not engaging in activism or debating strangers on hot button issues, you can find him writing about society, health, and ways to advance causes that will protect our future. Though born and raised in the Midwest, Mr. Eck has lived in every major region of the country, thanks to a dominant strain of nomadism in his DNA. Experiencing a wide swath of cultures and classes across the United States—as well as extensive travel abroad—has only stoked his passion for making the world a better place via meaningful action and policy-based reforms.